President Obama's leftist base is rallying to support his upcoming first budget. With opposition to Obama's massive spending spree growing, the US left is mobilising to neutralise both Republican and moderate Democratic Party opposition. Obama's far left allies are explicitly targeting moderate "Blue Dog" Democrats in order to force them into line. President Obama appealed to the people to throw their support behind his first federal budget to help pull the country out of the deep economic crisis. Speaking at his second White House news conference the President said the $3.5 trillion Fiscal Year 2010 budget is “is going to need the support of the American people,” adding that it is “inseparable” from his economic recovery program. He defended the billions allocated for green, renewable forms of energy, for health care, and education... He renewed his call for tax cuts for middle-income families and higher taxes on the wealthy. He called for elimination of wasteful spending on Medicare and in military procurement. Obama's base groups most of the leftist mass organisations which helped push him over the line last November. A coalition of 100 organizations initiated by Americans United for Change was already answering Obama’s appeal, launching a grassroots campaign to push through Obama’s budget in the face of stubborn opposition by the Republican right and a handful of Blue Dog Democrats. The coalition includes the AFL-CIO and many of its affiliated unions, ACORN, SEIU, U.S. Catholic Conference, the YMCA and YWCA, NAACP and dozens more organizations with tens of millions of members. Organizing for America, with more than 14 million people who helped elect Obama in its database, launched a door-to-door campaign March 21 in support of the budget. MoveOn has scheduled a similar effort. Behind many of these organisations lie the hard red core of the Obama movement-specifically Democratic Socialists of America, Communist Party USA and the ultra left Washington based "think tank" Institute for Policy Studies. 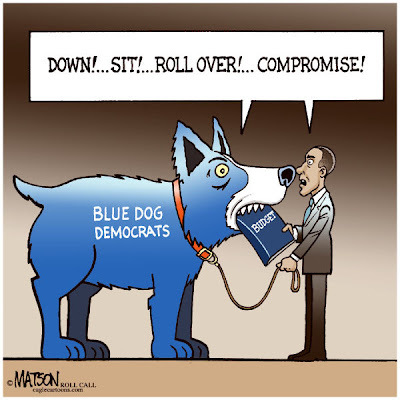 Robert Borosage, co-chair of the Campaign for America’s Future and William McNary, president of USAction announced a grassroots campaign to pressure Blue Dog Democrats to vote for Obama’s budget. Eight of these Democrats joined with Republicans in opposing efforts to win passage of a Budget Resolution that included the $684 billion health care fund and tens of billions more for Obama’s green energy program. It requires only a simple majority of 51 senators to pass a Budget Resolution so it is not subject to a Republican filibuster that requires 60 senators’ votes to end. “If they feel a little heat at home they may see the light in Washington,” he said. McNary said 50,000 members of USAction will mobilize in the Blue Dogs’ districts. Robert Borosage is one of the most influential leftists in America. From 1979 to 1988 Borosage was Director of the Institute for Policy Studies. In 1988 he left IPS to work on Jesse Jackson's presidential campaign, for which he served as a speechwriter and an assistant in framing responses to policy issues. Wellstone, Boxer and Moseley Braun were all far leftists. Moseley Braun in particular was the product of the same Chicago communist/socialist coalition that produced the Barack Obama phenomonon. Borosage remains a Institute for Policy Studies Trustee alongside leading Democratic Socialists of America member and Progressives for Obama founder Barbara Ehrenreich. Institute for Policy Studies has links to Communist Party USA and is extremely close to Democratic Socialists of America. It also has a long history of links to communist intelligence services and third world revolutionary movements. In my view IPS is a key component of the Obama machine. William mcNary is a long time Obama friend, colleague and advisor. He was also a Democratic party delegate for Obama at the Democrats 2008 convention in Denver, Colorado. McNary is also close to Democratic Socialists of America and has a strong and long term relationship with the Communist Party USA. 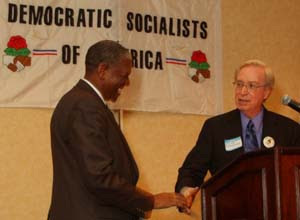 William McNary left, receives an award at 2005 Chicago DSA dinner. An article in International Socialist Review of January/February 2009 covered the US antiwar coalition, United for Peace and Justice (UFPJ), national convention in Chicago-December 12 through 14 2008. The article's socialist authors complained that UFPJ (which is almost totally controlled by DSA, CPUSA and Committees for Correspondence for Democracy and Socialism)had neglected the anti War movement in favor of electoral politics. While the U.S. continues to occupy Iraq and is planning a major escalation of forces in Afghanistan and Pakistan, the conference drew only 248 attendees, fewer than at its convention last year. Such a low turnout should come as no surprise; UFPJ has not called a major national antiwar demonstration in close to two years and has invested the bulk of its resources either directly or indirectly into campaigning for the Democratic Party. “We have elected the most progressive mainstream politician imaginable,” declared William McNary, president of USAction/TrueMajority, at the opening plenary. McNary went on to describe Obama as our “quarterback” and that the movement’s task is to “block for” him. The job of the left is block all opposition, so that Obama can score touchdown after touchdown for Team Left with as little opposition as possible. If that means "blocking" some of the president's own Democratic Party team mates, so be it. I hope those Blue Dogs do chew up Obama's budget and spit out something he may not like, say an actual free market solution? Why quote the communist People's Weekly World (or whatever it's called nowadays) as a representative of the "left"? It probably has a circulation of under 100! Please tell whoever sponsors this blog that to insult leftists and/or liberals by calling them communists is extremely out of date. In case you're interested, the Soviet Union is no longer a factor in world politics. Whatever communists are still around are mainly over 80. To take a page out of J. Edgar Hoover and Nixon's book at this late date is pathetic, at best. Anonymous, you are part of the problem. Just because communism lost traction in Russia doesn't mean there aren't any cmmunists. Angela Davis is still teaching it at UC Bezerkley( intended spelling)and remember it was the Union Of Soviet Socialist Republics. Have you forgotten the Chinese COMMUNISTS ? Or Cuba ? Socialism is running rampant in the US and Europe. It is a failed system but has too many adherents that want the power they feel they can get through socialism. If it walks like a duck , quacks like a duck and flies and swims like a duck, it probaly isn't a kangaroo. What is pathetic is; are you truly that ignorant or are you a progressive trying to dismiss concerns of real Americans ? Either way, wake up before you start standing in 6 block lines for toilet paper.